While leaving for work this morning I said to my wife, “It smells like fishing season!” to which she responded, “That’s because it’s not even a month away”. I am particularly proud that my city-based writer/blogger/nightlife columnist wife knows that fact proving yet again that 1.) I am the luckiest guy in the world and 2.) She is preparing herself to be a “fishing widow”. My excitement for opening day has been thrust into overdrive due to unusually warm weather, knowledge of recharged aquifers, and stream conditions conducive for trout fishing. The anticipation is mounting and I cannot wait for the season to begin but first there are things every serious fisherman must do to prepare for the upcoming season. Most experienced fishermen routinely purchase their fishing license out of habit, but not all prospective fishermen remember this crucial first step. Many forget about buying a license until the morning of opening day when they arrived at the stream and get out of their car with their buddies. You do not want to feel the shame of leaving the stream to get a license while your friends kickoff the new season without you. Here are a few things to remember when purchasing your fishing license. – Licenses can be purchased for the entire season as well as in 1, 3, and 7 day increments. – 2012 Licenses, stamps, and permits are valid December 1, 2011 – December 31, 2012 and can be purchased online at the Pennsylvania Fish & Boat Commission and Pennsylvania Game Commission’s The Outdoor Shop. 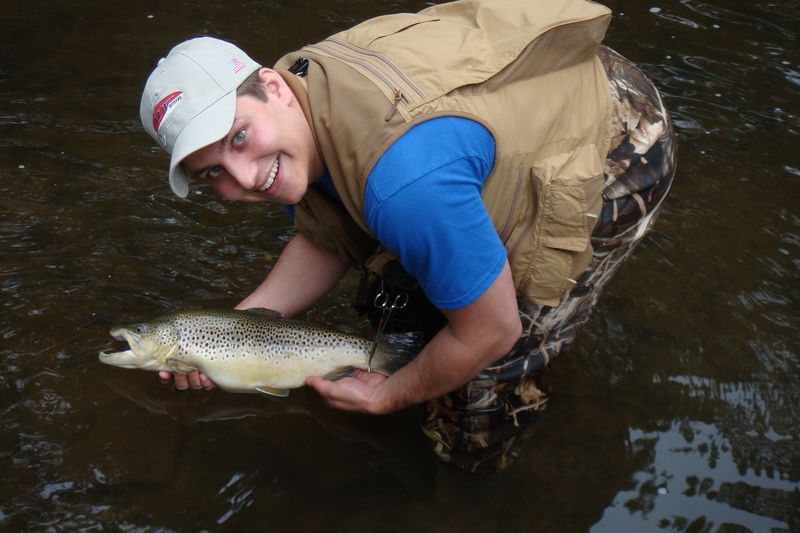 Andy Surra takes a moment to pose for the camera with this Pennsylvania brown trout before releasing it back to the stream. Inspect your rods and reels for any irregularities weeks in advance of the fishing season giving you plenty of time to fix any mistakes and purchase any items of necessity. (Editor’s note: Items of necessity is a subjective term. Just ask the spouse of any serious angler.) Be sure to check your rods for any cracks, broken or bent eyes, loose cork or reel seats, and other damages that may have occurred while they were in storage. Next, line your reels with NEW fishing line. I prefer Berkley Trilene XL Low Vis Green but will be considering Berkley Trilene 100% fluorocarbon on my spin casting trout reels with 8lb line and a 2-5lb leader. Whether you are fishing with live bait or flies, get organized!! Make sure your fishing vest or chest pack is sorted to your liking to ensure easy accessibility to the equipment you need and use the most. 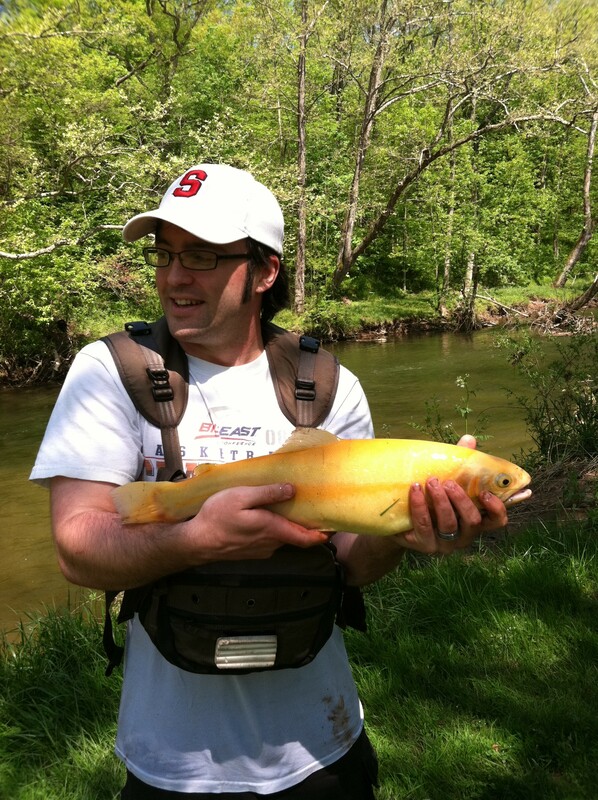 Josh Keebler shows off this trophy Palomino he caught using a nightcrawler while fishing the Yellow Breeches in 2011. In the weeks prior to opening day take some time to review the 2012 Trout Stocking Schedules for your local area. Scout sections of your waterway of choice that you are planning to fish. Pay attention to water temperature and depth, as well as, stream speed, shape, and structure to best determine where the trout are located and more importantly what they will be feeding on. Knowing your waterways will help you be successful throughout the entire season and in all weather conditions. 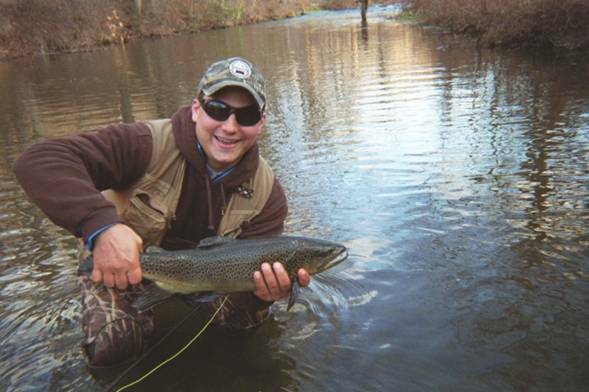 Trout season begins on March 31st in Southeast PA and on April 14th Statewide. Use this unique opportunity to share something you love with your family and friends. Make opening day an annual event that you share with the people you love the most and you will be rewarded with a time honored tradition filled with countless stories and outdoor experiences.